Another month is here, and we have a special guestmix from one of our local buddies, mr Randall Spaulding! When :: Tuesday, August 21, 2007 @ 2PM-4PM US EASTERN TIME, CONVERT TIME. I can't believe I'm saying this, but I'm at the point where I have too much trance music. lol. But, hey... that's not going to stop me from getting your mixes. You always do a great job and I have seen you guys get better and better over the years. Keep it up. "too much trance music" No friggin way, keep it coming! 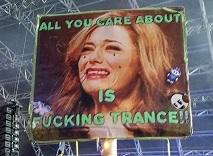 Can't wait for MORE trance music! I have to agree with you. I am totally obsessed and addicted to it. I just can't seem to get enough of it. This was a great mix, listened to it yesterday. Is it going to be posted for DL? I'm really looking forward to listening to it again. Yeah soon. Patience is a virtue. What I caught on DI was great. I'm torrenting this thingy right now! I didn't like the Randall Spaulding mix very much. I'm not a fan of songs with NSFW lyrics, which that mix was full of. The GT vs Project C mix was awesome (as usual). Keep up the good work guys! Basically, I don't like a whole lot of profanity or sexual innuendo in my music. I'm fine with a little bit, but I thought Randall's mix was over the top. As long as the music is good, I don't really care. Same thing in movies. They have lots of swearing but I still enjoy the movie. Starts ok and after 21 minutes it became different. The PM mix of GT&PC was fantastic at once!! sorry but http links are finally up. he's definitely a naughty boy! Posted: Tue Sep 04, 2007 11:56 am Post subject: Now I REALLY can't wait to hear! I'm downloading now and the posts about Randall's mix make me want to hear it even more! You guys ROCK!!! All I have on my iPod is GT mixes!!! Am going to Tiesto in ATL on the 14th!!! Can't wait!!! I like naughty but as in a female or music or movies. Posted: Wed Sep 05, 2007 12:42 pm Post subject: Re: Now I REALLY can't wait to hear! All I have on my iPod is GT mixes!!! Am going to Tiesto in ATL on the 14th!!! Can't wait!!! Posted: Wed Sep 05, 2007 3:00 pm Post subject: Re: Now I REALLY can't wait to hear! Yeah I have all my Gt mixes on dvds. Spaulding!!! The clown from The Devils rejects, riiiiight!!!! i'm liking this. mostly the second mix, way way way ownage.